To WATCH a documentary of Dorothy Netherland painting on glass, CLICK HERE. 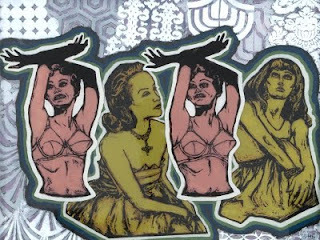 Dorothy Netherland's paintings are painted and silkscreened on the back of glass. The new paintings consist of three layered sheets of glass. For exhibition preview, click here. For installation images, click here. For printmaking demonstration schedule, click here. Reception: Thursday, Jan. 15, 5 – 10 p.m.
For its January 2009 exhibition, if ART Gallery presents Salon III, an exhibition of prints by gallery artists at if ART Gallery, 1223 Lincoln St., Columbia, S.C. The opening reception will be Thursday, January 15, 2009, 5 – 10 p.m. The exhibition will be installed salon-style at the gallery’s first floor and continues if ART’s salon-style exhibitions; in December 2008, Salon I & II took place simultaneously at the gallery and Gallery 80808/Vista Studios in Columbia. Among the printmaking techniques represented in the exhibition are etchings, dry points, lithographs, woodcuts, linocuts, photopolymer prints, embossings, monotypes, silkscreens and photo transfers. During the exhibition, gallery artists Steven Chapp of Easley, S.C., Phil Garrett of Greenville, S.C., Brown Thornton of Aiken, S.C., and Marcelo Novo of Columbia will give demonstrations of various printmaking techniques. For times and demonstrated techniques, see above. Artists in the exhibition include Karel Appel, Jeri Burdick, Carl Blair, Lynn Chadwick, Steven Chapp, Corneille, Jeff Donovan, Jacques Doucet, Phil Garrett, Herbert Gentry, Tonya Gregg, John Hultberg, Richard Hunt, Sjaak Korsten, Lucebert, Reiner Mährlein, Sam Middleton, Eric Miller, Joan Mitchell, Dorothy Netherland, Marcelo Novo, Hannes Postma, Edward Rice, Anton Rooskens, Kees Salentijn, Laura Spong, Brown Thornton, Bram van Velde, Katie Walker, David Yaghjian and Paul Yanko.